As the cricket frenzy catches the nation by storm Housejoy, the leader in home services category in India, releases a video on cricket that show both men and women watching cricket. The difference is that they show women enjoying cricket in their own style! 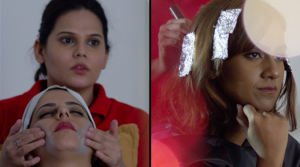 In the ad, women are seen enjoying beauty services at their home while watching cricket. The film has been directed by Saad Khan, founder and creative head of Centerstage. He is Bollywood and Hollywood Director.